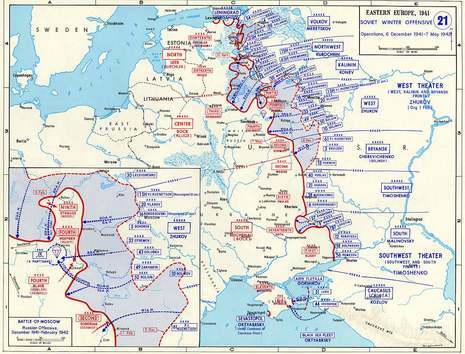 Although the Wehrmacht's offensive had been stopped, German intelligence estimated that Soviet forces had no more reserves left and thus would be unable to stage a counteroffensive. This estimate proved wrong, as Stalin transferred fresh divisions from Siberia and the Far East, relying on intelligence from his spy, Richard Sorge, which indicated that Japan would not attack the Soviet Union. The Red Army had accumulated a 58-division reserve by early December, when the offensive proposed by Zhukov and Vasilevsky was finally approved by Stalin. However, even with these new reserves, Soviet forces committed to the operation numbered only 1,100,000 men, only slightly outnumbering the Wehrmacht. Nevertheless, with careful troop deployment, a ratio of two-to-one was reached at some critical points. On December 5, 1941, the counteroffensive started on the Kalinin Front. After two days of little progress, Soviet armies retook Krasnaya Polyana and several other cities in the immediate vicinity of Moscow. The same day, Hitler signed his directive number 39, ordering the Wehrmacht to assume a defensive stance on the whole front. However, German troops were unable to organize a solid defense at their present locations and were forced to pull back to consolidate their lines. Guderian wrote that discussions with Hans Schmidt and Wolfram von Richthofen took place the same day, and both commanders agreed that the current front line could not be held. On December 14, Franz Halder and Günther von Kluge finally gave permission for a limited withdrawal to the west of the Oka river, without Hitler's approval. On December 20, 1941, during a meeting with German senior officers, Hitler cancelled the withdrawal and ordered his soldiers to defend every patch of ground, "digging trenches with howitzer shells if needed." Guderian protested, pointing out that losses from cold were actually greater than combat losses and that winter equipment was held by traffic ties in Poland. Nevertheless, Hitler insisted on defending the existing lines, and Guderian was dismissed by Christmas, along with generals Hoepner and Strauss, commanders of the 4th Panzers and 9th Army, respectively. Fedor von Bock was also dismissed, officially for "medical reasons." Walther von Brauchitsch, Hitler's commander-in-chief, had been removed even earlier, on December 19, 1941. Meanwhile, the Soviet offensive continued; in the north, Klin and Kalinin were liberated on December 15 and December 16, as the Kalinin Front drove west. The Soviet front commander, General Konev, attempted to envelop Army Group Center, but met strong opposition near Rzhev and was forced to halt, forming a salient that would last until 1943. In the south, the offensive went equally well, with Southwestern Front forces relieving Tula on December 16, 1941. The Luftwaffe was reinforced, as Hitler saw it as the only hope to "save" the situation. Two Kampfgruppen (II./KG 4 and II./KG 30) arrived from refitting in Germany, whilst four Transportgruppen with a strength of 102 Junkers Ju 52 transports were deployed from Luftflotte 4 to evacuate surrounded Heer units and improve the supply line to the front-line forces. It was a last minute effort and it worked. The German air arm was to help prevent a total collapse of Army Group Centre. Despite the Luftwaffe's best efforts, Soviet air superiority had contributed enormously to the Red Army's victory at Moscow. 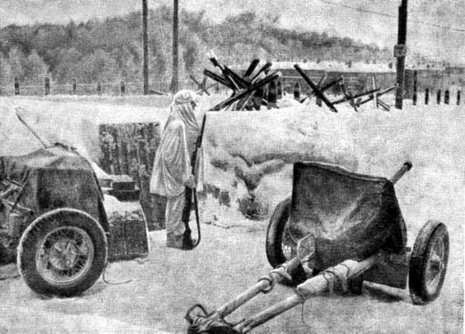 Between the 17 December and 22 December the Luftwaffe destroyed 299 motor vehicles and 23 tanks around Tula, hampering the Red Army's pursuit of the German Army. In the center, however, progress was much slower, and Soviet troops liberated Naro-Fominsk only on December 26, Kaluga on December 28, and Maloyaroslavets on January 2, after ten days of violent action. Soviet reserves ran low, and the offensive halted on January 7, 1942, after having pushed the exhausted and freezing German armies back 100 to 250 km (60 to 150 mi) from Moscow. This victory provided an important boost for Soviet morale, with the Wehrmacht suffering its first defeat. Having failed to vanquish the Soviet Union in one quick strike, Germany now had to prepare for a prolonged struggle. Operation Barbarossa had failed. Hitler's campaign against the Soviet Union started by sending 7.2 million troops into the Soviet land. They caught the red army off guard and had a quick success. By July 17th, the Germans were less then two miles from Moscow. The attack was postponed as the winter immobilized tanks and made it difficult for troops to move. The Red Army was quite ready and used the snow to begin a counterattack against the Germans. This forced the Germans to retreat. Hitler was not yet finished however.